I really love the Olive Garden. Love those heavenly bread sticks dipped in a little Zupa Toscana. Love going there with friends and family and MyHandsomeHusband. Not really the same if he doesn’t come along. He makes my world go round, you know. I can’t say it is EXACTLY the same as the good old OG. Make some today…..everyone deserves fabulous! 1. Combine all dressing ingredients in a blender or small food processor and mix until well combined. 2. 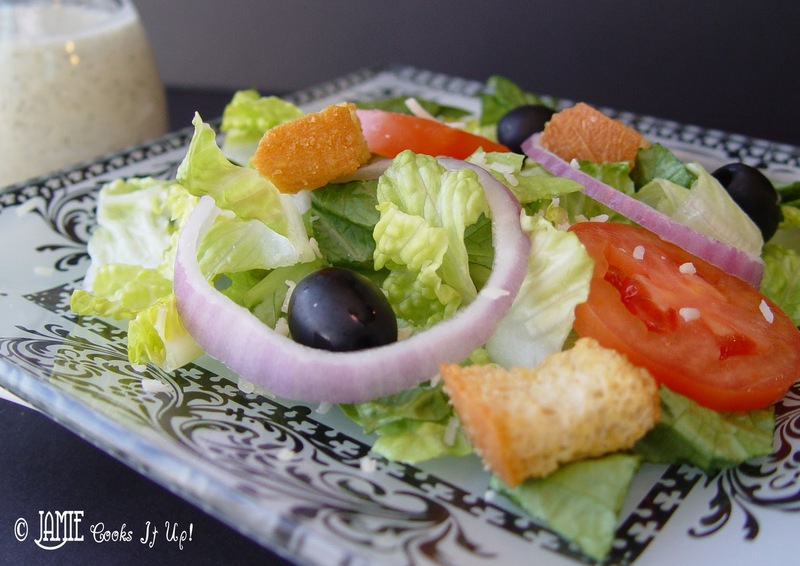 Chop your lettuce, tomatoes and red onion. 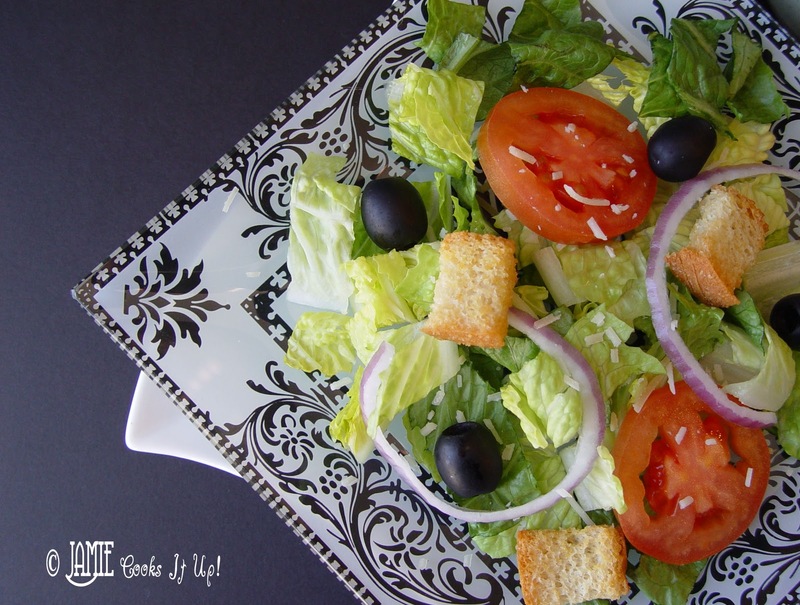 Add your olives, croutons and Parmesan cheese. Toss to combine. 3. Pour dressing over the top. Toss to coat and serve immediately. I am going to try this recipe and I also want to know where you bought this plate. I love it! oh my! looks wonderul! how long does this keep in the fridge? thanks for sharing! You had me at Olive Garden, but FABULOUS was the icing on the cake (or the dressing on the salad! 😀 ). I am a huge fan of their dressing, so this is now on my must make list. I don't suppose you have a recipe for the Zuppa Toscana soup? if u go to copycat recipes.com its has all the soup recipes for olive garden n alot more olive garden recipes n every other awesome restaurant u can think of.. I'm pretty sure I bought the plate on a clearance shelf at Hobby Lobby. I think you may be able to get away with out the corn syrup…maybe add a little splenda? Let me know how it turns out. PS…glad you got the fabulous joke! I bet it would last at least a couple of weeks, though ours is usually eaten pretty quickly so I'm not positive. I have had Zuppa Toscana on my list to make for quite some time, just haven't ever gotten to it yet. Hopefully soon! Thanks everyone! Have a good night! I love Olive Garden. Tommorrow is Olive Garden night right here at home. Now I have the Zuppa, breadsticks and salad thanks to you!! Your rock. Keep up the great work. I love all the down home, straight from the pantry cooking! Thanks for posting all of the Olive Garden recipes. I made them for dinner last night and everyone loved it! We love Olive Garden but don't love the price of actually eating there. Now we don't have to go without!! Thanks for all the fabulous recipes! Love your site and all your recipes. The only thing I would say about this one, is to throw some banana peppers in there too, just like at Olive Garden, felt they were missing, but again maybe that is a good thing for people who just pile them on the side of their plate anyway? Thank you for this recipe Jamie! I live overseas right now, and this was so good and totally hit the spot! Thanks again! OH MY GOODNESS! This is the first time my guests were getting seconds on SALAD! Yummy – thanks so much! 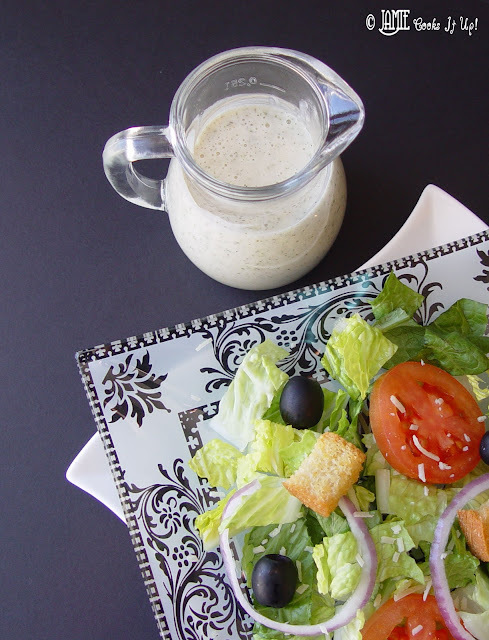 I did make this dressing this past summer for my family. We thought it was better than the original. I will be making it again! What are the little mild peppers in the Olive Garden salads? I believe the peppers Olive Garden serves in their salad are pickled banana peppers. But this is just a guess! Good luck! Hope you find what you are looking for! They are pepperoncinis sometimes called Tuscan Peppers. I wanted to save this recip to a folder. And it will not let me. I saved the Bead Sticks. So can you please push your little button, so we can save it??? I do like Olive Garden's salad, soup, and a few of their entrees, but not any with the tomato based pasta sauce. They do not know how to make a good one….mine is far superior. I do use garden fresh tomatoes and let it simmer all day…theirs tastes like it comes from a store brand jar of pasta sauce without anything added to it. I’m in heaven. This recipe is FABULOUS, Darling! Thanks so much! To Tori (Feb 6, 2100): I not only don’t “need” sugar, I can’t have it, period, for medical reasons. I’ve also for seven years been restricted to more than 30 grams/day of ANY sort of carbohydrates. So instead of giving up my foodie ways, I invested in a bottle of liquid sucralose, sold under a variety of different brand names (the one in my pantry right now is Sweetzfree: http://www.sweetzfree.com). IT IS NOT CHEAP, but since only a drop or two replaces an awful lot of sugar, my $64 4-oz. bottle is still more than 80% full after using it several times a week for almost four years! Only one minor drawback: it can’t produce that crunchy glaze we all love about brown sugar- or molasses-based BBQ sauces. In a recipe like this, however, you might want to give it a try! Would like to know how much sugar to use instead of the bad corn syrup you have listed. I don’t use the stuff–it’s terrible for you! Even in that small amount! Thank you! 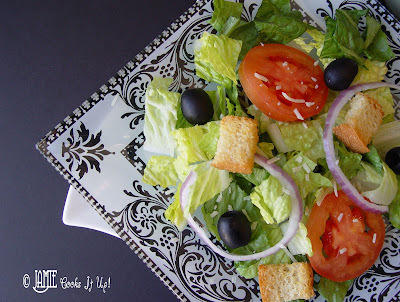 My family loves the Olive Garden salad so much, my wife went on line and voila the recipe. I put it together tonight for dinner and everyone raved about how great it was. I am going to try it in my foods class with my students that love the O.G salad as well. Loving my magic bullet. Use a whole lemon if you want everyone to drool when they eat it!!!!! When making your dressing and you add Parmesan cheese are you adding the shredded or the grated or does it matter?